Bakabana is a fried plantain dish from Suriname, of Indonesian origin. 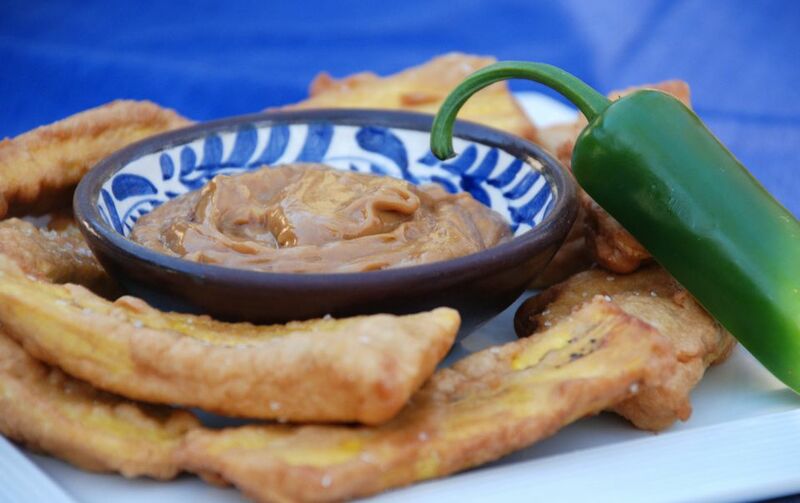 Slices of ripe plantain are battered and fried, then served with a spicy peanut sauce. Plantains are versatile and can be cooked while they are still green, but this dish is especially delicious with sweeter, ripe plantain (when the outside of the plantains are black). In a medium bowl, whisk together the egg, flour, buttermilk, sugar and a generous pinch of salt. Add some water gradually, enough to make a thick, smooth batter. The batter should not be too runny or it will not adhere to the plantain slices. Set the batter aside to rest for 15 minutes. Slice the ends off of the plantains. With a sharp knife make a slit in the skin of the plantain from one end to the other. Pull the skin off. Slice the plantain diagonally into slices about 3 inches long, and about 1/3 inch thick. Place the plantain slices into the batter and stir to coat them. In a heavy pot, deep skillet, or deep fat fryer, place the oil to a depth of about 2 inches. Heat over medium-high heat to about 350 F, or until a drop of batter sizzles well and browns lightly. Carefully cook the plantain in the oil (in batches if necessary) until golden brown on both sides (turning once), about 3 to 4 minutes. Drain on paper towels and sprinkle with salt. Serve warm with peanut sauce for dipping.